Changing how a company does business can be a daunting task—especially when that change includes tracking millions of lumber pieces. The economic climate of the housing construction industry has created a shift in how Hampton Lumber Mills sells to its customer base. 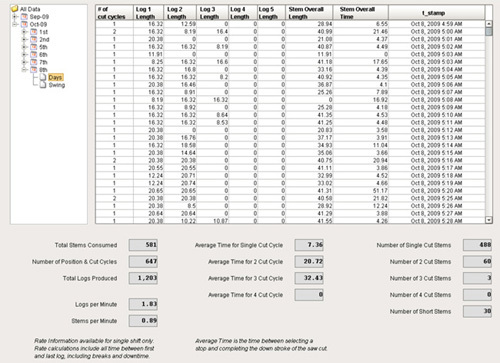 In order to forecast sales and fulfill customer orders with precision, Hampton knew it needed to be able to efficiently track what, when, and where lumber pieces were being produced. Hampton's Electrical and Controls Engineer Jason Conolly explained that the company's production strategy has changed with the marketplace. Instead of selling whatever lumber is produced, the company needed to focus on manufacturing specific lumber products to meet customer demand. The sales group needed accurate predictions of what lumber would be available in the future to maximize sales returns. The manufacturing group also needed similar predictions to adjust process parameters in the mills to get the best possible match between customer demand and the actual lumber produced. Hampton Lumber Mills used to do the above analysis by hand using pivot tables in Excel. Similar reports were available from legacy systems, but did not include all of the information in one place. Now, this information is archived in a SQL database which allows previous shifts to be analyzed, without referring to old printouts. Their existing method for gathering production data was by hand, which wasn't adequate to get the product forecasts the company needed. "We've always used PLCs and operating interfaces," Conolly explained. "But then we had to walk around to gather data. The data we had was only shift summary data. We couldn't get details for each piece, the kind of information we needed to build accurate forecasting models." Hampton knew they needed a way to get detailed information for each piece of lumber that was produced, and was seeking to change how they obtained their data. They also knew they needed the tools to track increasingly large data sets. The lumber mills' search for a data acquisition solution led them to Inductive Automation software. FactorySQL was the answer to collecting the detailed raw data they needed. SQL tools could then be used to roll that information up to the plant level—where business decisions were made. "SQL tools have been important as we start working at the plant level," Conolly said. "FactorySQL gave us the information needed to improve our forecasting models." FactorySQL proved very useful in gathering a lot of details, and that detailed information was useful for more than just forecasting models. Hampton saw a need to be able to analyze the data quickly in a variety of new ways. "No one can read through these large data sets by hand," Conolly stated. "Traditional HMI software that we've used in the past worked great, but didn't have the tools to handle large historical data sets. We started trying to build ad hoc queries in Microsoft Excel, but quickly exceeded the row limitations in that software." Hampton returned to Inductive Automation software and integrated FactoryPMI, which was the perfect fit for analyzing the data. With FactoryPMI in place, Hampton discovered a new ability to answer unanticipated questions. Before, when data was collected by hand, it could take a month or two to start tracking the specific data needed and get an answer. Since FactorySQL is storing the raw information into a historical database, if an unexpected question comes up, FactoryPMI can analyze the existing data, and get the answer immediately. This FactoryPMI report was used to justify a capital project that would reduce the number of multiple position and cut cycles on a buck saw. It allowed Hampton Lumber Mills to make a business decision based on facts instead of relying on guesswork. "Now that we have all this data, when a question comes up we don't have to go and start tracking new information," Conolly said. "A lot of times, we already have the detailed raw data. We just need to build a new query. We can answer the question the same day. It's great to go back with an answer to those questions, instead of getting the answer a month later." Conolly gave an example from a recent question that came up regarding production. Hampton has been using FactorySQL to log data for one of the gang saws in its Randle, Washington mill. The "gang" uses a bank of parallel saws to cut a number of pieces of lumber from the same log segment in one pass. This particular gang has a specific position in the bank of saws that can cut an extra 1-inch thick piece of lumber if the log is big enough, but that saw position was wearing out before the bank of saws could be changed. The saw availability was one factor to consider, the other was the shape of available logs. Not all trees are the right candidates for the extra 1-inch cut. Conolly needed to figure out how many appropriate logs were available, and how much time was available on the saw to cut 1-inch pieces. He explained, "There used to be no way to go back and see when the saw was available and when the log shape was available to make the 1-inch pieces (referring to when they collected data by hand). Yesterday, in half an hour, I could build a query against existing SQL data and show a trend in PMI of the percentage of time the 1-inch saw pocket was not available but we were processing logs that could have used it. 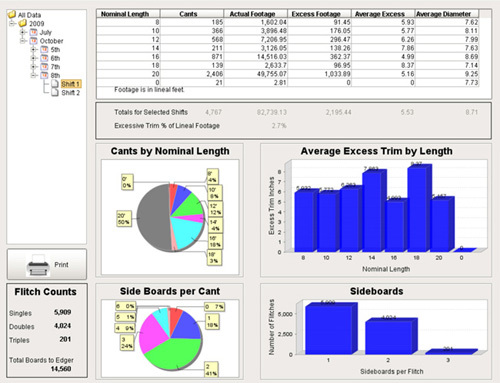 We can now make business decisions on whether it is cost effective to make the product on that saw. Without these tools, we would have had to build counters in the PLC, then capture that data by hand each shift for quite a while to make the same decision." Without the easy accessibility of production data, Conolly said that in the past they relied on instinct and experience to make decisions. Now they can improve business decisions with factual statistics. "It used to be you had to make a gut decision," he said. "Now we can back those decisions up with actual statistics. Using FactoryPMI, anyone in the company can look at the projects and pull up that trend and see what that data looks like and make decisions. It also prevents having to answer the same questions repeatedly as conditions change over time." Conolly summarized the results of using FactorySQL and FactoryPMI: "The data collection and analysis capabilities immediately met a specific need in our quest for world class performance." Hampton Lumber Mills has been producing a variety of wood products and services for the construction industry for more than 55 years, and is one of the nation's largest privately-held forest products companies. Hampton operates seven sawmills in Oregon, Washington, and British Columbia.